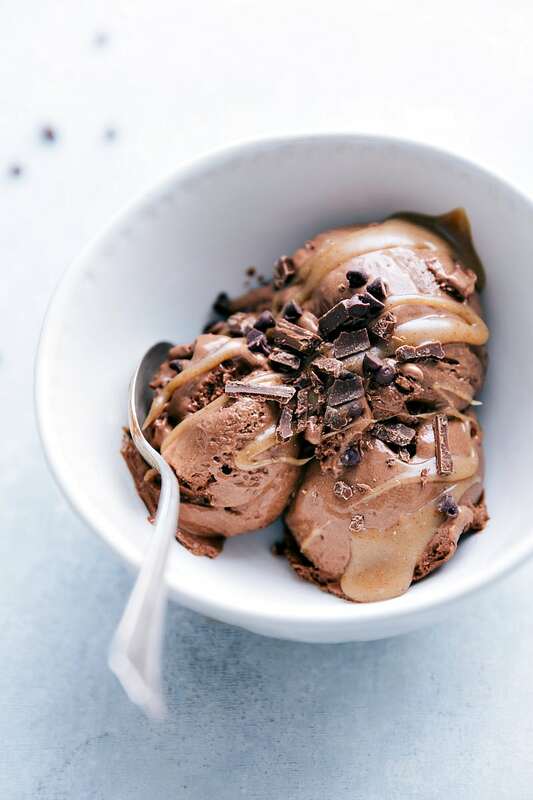 Delicious chocolate ice cream made with better-for-you ingredients, packed with protein, and drizzled in a delicious caramel sauce. 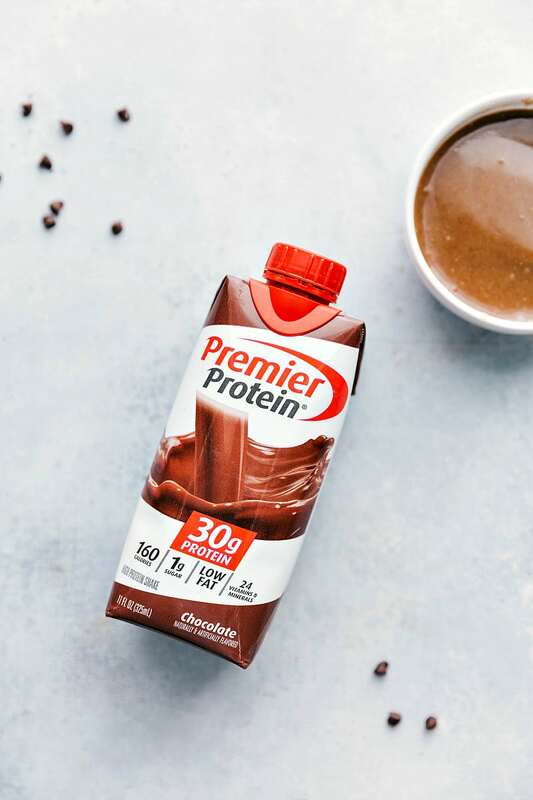 Special thanks to Premier Protein for partnering with me this year to bring you delicious treats like this healthy chocolate ice cream with caramel sauce! I know what you’re thinking – this must be another one of those banana-based healthy “ice creams” that have taken over the internet. If that’s your style I’m sorry to disappoint – no bananas here! No matter how hard I’ve tried to like it, I’ve never enjoyed banana ice cream. While many people do like it (my kids included), it’s nothing I’ll make for myself. Enter: healthy chocolate ice cream WITHOUT bananas. With just a few healthy ingredients, a blender, and an ice cream maker you can have an incredibly creamy and healthy chocolate ice cream. AND if that weren’t enough, we’re also topping it with a caramel sauce that is again, made with better-for-you ingredients. YUM! What ingredients are in Healthy Chocolate Ice Cream? So if there aren’t bananas in this, what am I using instead? The answer is… a sweet potato. I know, I know, that sounds absolutely crazy, but you have to trust me on this one. Although it seems gross, you can NOT tell there is a sweet potato in this ice cream. The flavor is completely masked behind the chocolate, but it leaves us with tons of nutrition and a thick creamy base to work from. Next up is my favorite chocolate protein shake made by Premier Protein. It’s rich, creamy, and you really wouldn’t guess it’s packed with protein, low on sugar, low fat, and filled with vitamins and minerals. And since you can never have too much chocolate, I also add in some dark chocolate. The dark chocolate chips help strengthen the chocolate flavor and thicken up the ice cream. Dark chocolate is packed with good antioxidants and healthy fats your body needs. To round things out, you’ll add in a little bit of coconut sugar, vanilla, and salt to enhance flavors. Add the coconut sugar to taste based on how sweet you’d like your treat. One question I get frequently on other recipes is: “can cocoa powder be substituted for chocolate chips?” And the answer is unfortunately not. While you can use a different kind of chocolate chip (vegan, dairy-free, milk, or semi-sweet), you need a chocolate chip, not cocoa powder. 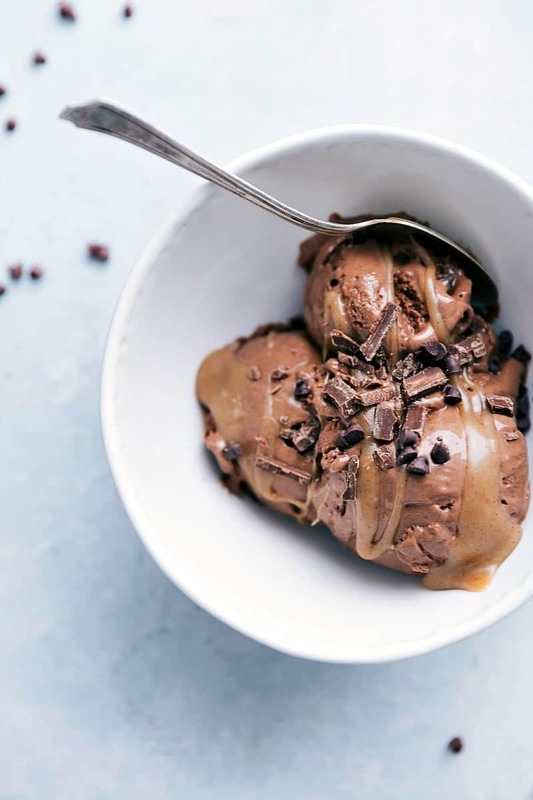 Can I substitute ingredients in this healthy chocolate ice cream? Of course you can always experiment and try any substitutions you’d like, but I likely won’t be able to tell you if your specific substitution will work out. One question I get frequently on other recipes is: “can cocoa powder be substituted for the chocolate chips?” Unfortunately not. While you can use a different kind of chocolate chip (vegan, dairy-free, milk, or semi-sweet) I don’t know of a different ingredient that can replace the chocolate chips in this recipe. 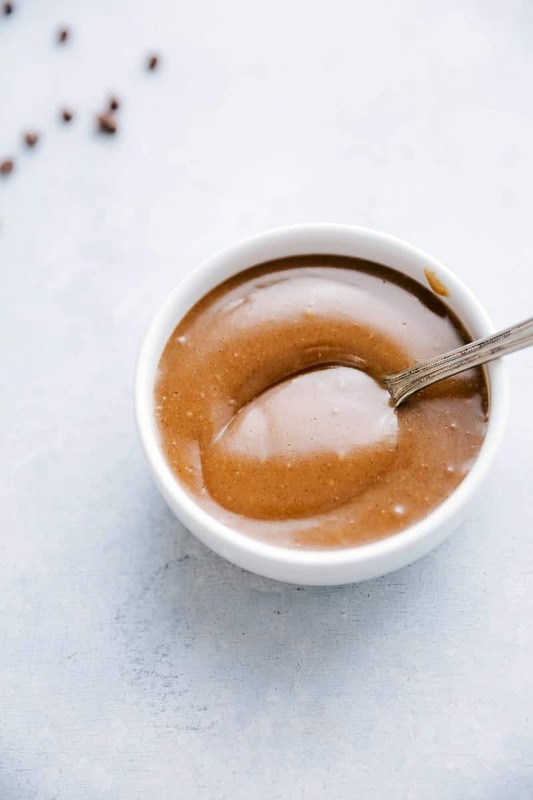 This caramel sauce is AMAZING and couldn’t be easier to throw together! There are only 5 ingredients: maple syrup, almond butter, coconut oil, salt, and vanilla. Microwave the solid coconut oil with the maple syrup until the coconut oil is melted and whisk until it’s all smooth. Add in the almond butter while the ingredients are still warm and whisk until smooth. Next, you’ll add in the salt and vanilla and then let it stand at room temperature for about 30 minutes to thicken up. Drizzle it all over this healthy chocolate ice cream and enjoy! 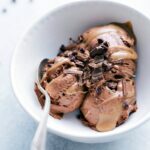 Delicious chocolate ice cream made with better-for-you ingredients, packed with protein, and drizzled in an amazing healthy caramel sauce. Wash and scrub the sweet potato. Piece with a fork several times over the potato. Place on a microwave safe plate and microwave for 5 minutes, flip and microwave for another 5 minutes. Remove and allow to cool. Meanwhile, place the bag of chocolate chips in a microwave safe bowl and microwave in increments of 20 seconds, stirring in between each increment for 15 seconds until smooth and melted. Set aside. The sweet potato should be cool enough to touch now. Remove the skins and then THOROUGHLY mash the potato. Pack into a measuring cup to get exactly 3/4ths a cup. Place in a large blender. Place the lid on the blender and blend on high for at least 1 minute or until ingredients are completely smooth and incorporated. Transfer to an ice cream maker and prepare according to manufacturer's directions (I have a Cuisinart and it took about 30 minutes to get to soft serve consistency) then transfer to an airtight container and place in the freezer to continue firming up. Freeze for 2-3 hours before enjoying. If you don't have an ice cream maker, it will still work just a little more effort Place the mixture in an airtight container in the freezer. Stir every half hour for 2-3 hours or until the mixture is ice cream consistency. Add the (solid) coconut oil and maple syrup in a microwave safe bowl. Melt in the microwave for 30 seconds, stir and return for another 30 seconds or until melted and smooth. Stir in the almond butter and whisk until smooth. Add in the sea salt and vanilla extract and again whisk to combine. Set aside, leaving at room temperature, to firm up for about 30 minutes. Top the ice cream with the sauce and a few chocolate chips if desired. *The ice cream might not need the coconut sugar depending on your personal preference; taste before adding and add after blending if desired. Chelsea. I would love to try this..What is the best ice cream maker on the market do you think? What ice cream maker do you use? This looks delicious and what a great idea using sweet potatoes in ice cream!